Proud Infinity is the 6th story in the VayneLine Chronicles and tells the story of a man trapped in a time loop he can’t break out of. The story follows things from Trego’s perspective as it starts off with him merely looking for a job at a bar. He sees a mysterious girl in the corner no one else can see but gets in a fight and has to ignore it. Later in the day he is shot, but kills his attacker. The injury is super bad and blew part of his shoulder off, he resorts to sticking a sock in the hole to help his nanites heal. He makes it back to his room and the color starts to fade away, he looks at his old work location to see a black wave expanding out that rips him apart. The next morning he realizes it was a dream and when events start to come true again (seeing the girl at the bar, an old guy on a walk, or a vehicle rumbling) he is convinced he has Psionic abilities. Over at the bar where he talks to the girl, Proud, introducing each other but she says she already knows his name. Using his ‘knowledge’ he avoid some things but is torn apart by the dark wave at the end of the night again. Convinced this is how Psionics manifest he heads over to the spaceport to get out before he is ‘really’ killed. He meets ‘Mitreah’ who is an attractive attendant at a spaceport Trego. They flirt with each other but when the rumbling vehicle he saw earlier comes out of a landing shuttle he realizes this is really happening. He rushes back to the bar, talking to Proud again. She seems to know much more than she lets on. Among other things they talk about, she changes her appearance, looking like an entirely different woman. Trego’s skepticism makes him think this could be a trick or a hologram. Eventually he dies again. He slowly realizes that he is stuck in a time fracture and no one else perceives it other than Proud. What follows is the story on what he deals with. The darkness he falls into, and how eventually he regains a spark of hope in an endless nightmare of death. 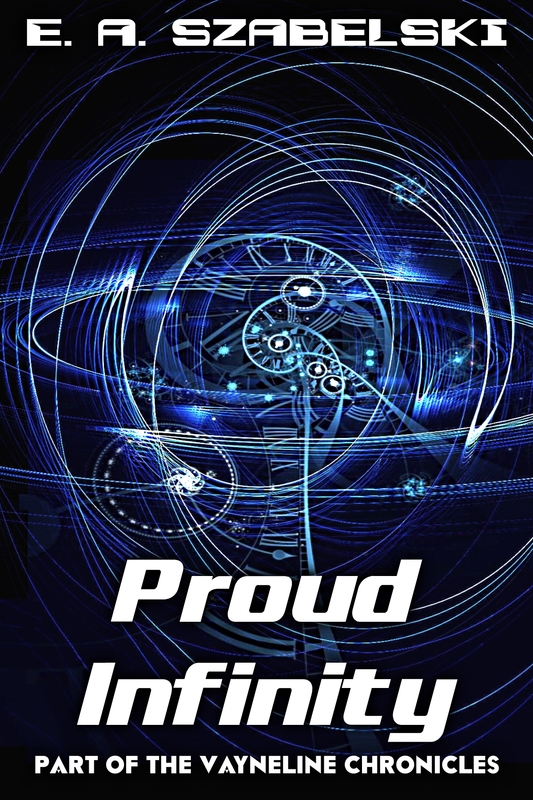 Proud Infinity is a story about Trego trapped in a time loop. The story starts in a normal daily routine that will become familiar. It is heavily implied after reading the story that the very beginning may in fact already be several loops in. He is a scientist that has been out of a job for a while, he was working on theories involving an ‘nonlinearity’ of time flow. Essentially that time did not appear to be linear everywhere. They found evidence of something big and was shut down. He goes to a bar looking for jobs, and first sees Proud here (and indicating no one else can see her), his asking for a job rubs people the wrong way and sets in motion the following events. He is attacked and leaves, meeting another key character, an old guy at the pit over-looking ReCorp. There is another important timing event: the rumbling of the truck that goes inside. Later he is attacked by a guy from the bar, is wounded and kills the guy. Stuffing a shirt into his shoulder, he stumbles back, only to die when the destructive wave comes out of ReCorp. He wakes up, remembering what happened. He goes about his day, seeing similar things like the old man, then at the bar talks to Proud briefly. She introduces her self in typical LineGod fashion of already knowing his name, with a subtle element of coyness/playfulness. He is harassed and shoots his way out. Dies again. A key element is there is NOT perfect remembrance of ‘past’ events. Thus Trego has a hard time piecing it together, and why he was chosen as he was actually the best one nearby to reverse the time fracture. What follows is many loops of him, first with him meeting Mitreah at the space port, she is flirty and fun. he realizes she is an android because she is ‘too perfect’. Hearing the truck triggers the memory and he runs back to the bar, talking to Proud more. She explains a key concept of being aware of life around them, and that many people are essentially shells. Being able to ‘see reality’ was a major reason Trego was chosen. She explains that she is a LineGod – essentially a manifestation of universal will. They are all-seeing but are not all-powerful, they cannot ‘do’ much as it effects Fate. Only actors who are not bound to this can do things to violate destiny or fate. This is a key concept in many VayneLine stories. Dying again sets off a massive reset. He realizes he has been living thousands of times, things like becoming friends with Proud, and so on have happened over and over. Things take a very dark turn as he becomes hedonistic, suicidal and wastes hundreds of loops chasing dead ends. He blows up the reactors, and Mitreah is killed. Waking up in prison he wonders if it was all a dream. A long time later (and only after the person who knew he was alive died) Proud is able to help break him out. Trego’s hair is now white (Axl Poisoning from proximity to a LineGod). Leaving together, she promises to protect Trego ‘for infinity’.